Unlike many mechanical contractors, Hardy Corporation employs a specific crew of experienced start-up technicians to perform final equipment connections, start-up, commissioning and checkout. This assures the customer of a quality project. Our start-up technicians ensure everything is fully functional and commissioned in accordance with the plans and specifications. Piping Systems: Pressure tests and confirmation of flow balancing, system flushing and cleaning, chemical treatment and confirmation of freeze protection. Pumps: motor voltage verification, verify amp draw, proper pump alignment and owner training. Duct and Air-Handling Systems: Installation inspections, confirmation and review of the test & balance reports, motor and fan start-up and leak testing as applicable. Chillers: Coordination with manufacturer’s start-up services to document performance measurements including capacity, evaporator and condenser flows, motor amperage, controls operation, confirmation of proper installation and operation. Cooling Towers: Document proper water flow, confirm test and balance reports, checkout and startup by manufacturer’s representative in conjunction with chiller, document performance measurements including water treatment chemicals, sound, tower capacity, motor amperage, pan heater operation, makeup water, overflow, and capacity controls . Boilers: Coordinate checkout and start-up by manufacturer’s representative, confirm combustion efficiency, capacity test, burner and controls operation. 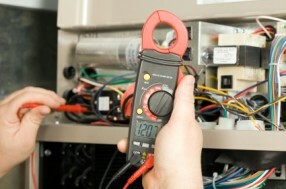 Fans: Document motor voltage and amp draw, verify fan rotation, adjust belts and pulleys and verify installation. Direct Digital Control System: Coordination with manufacturer’s representatives and to confirm proper operation of controlled devices and sequences of operation. Schedule owner training and system orientation.